I had a conversation with one of Hampden’s unique sons – George Figgs on Saturday. He’s now residing across the Jones Falls in neighboring Woodberry. We sat down in his living room, filled with memorabilia of his days as the owner of the Orpheum Cinema in Fell’s Point, (1991 to 1999), and chatted away about his colorful background. Hampden is a neighborhood that, in its early days, was home for working class people who labored in the nearby mills along the Jones Falls Stream Valley. Today, its residents reflect a changing city, with a vibrant shopping area, popular restaurants, ice cream and art stores, and multiple festivals. Figgs shared with me his fond memories of his childhood days, including schooling at St. Thomas Aquinas RC School on 37th Street, where he also served as an altar boy. He talked about his early family life. His mom was of Polish stock; and his dad of Welsh ancestry. His father was from a farming family originally from the Eastern Shore. Figgs’ grandfather was a cobbler, who had a shop on the Avenue in Hampden. As a young teenager, Figgs considered himself part of the counterculture scene and a “Beatnik.” He hung out around Martick’s, a restaurant and bar on Mulberry near Cathedral Streets in downtown Baltimore. 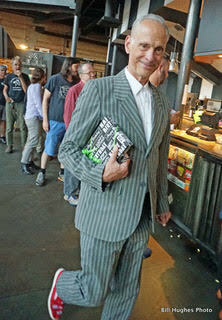 It was during this period, that he met the Baltimore filmmaking legend: the one, the only – John Waters! Figgs’ relationship with Waters led to acting roles in some of his classic comedic flicks, such as: “Dorothy, the Kansas City Pot Head,” “Eat Your Makeup,” “Pink Flamingos,” “Mondo Trasho,” and one of my faves, “Multiple Maniacs.” In the later flick, Figgs played the role of – Jesus Christ! In “Dorothy,” he was the scarecrow. Another Hampden neighbor of Figgs was the late Van Smith. He was the costume designer on many of John Waters’ films. Besides playing and singing in a band, along with Ben Syfu, also a Hampden boy, and school mate, Figgs found time to draw. One of his art works, “Baltimore Nocturne,” will soon be on exhibit at the American Visionary Museum, located on the Key Highway, near Federal Hill. Figgs also worked a stint as a ticket salesman at the Charles Theatre on North Charles Street during his meanderings before learning how to become a film projectionist. Figgs in to order to pay the bills also labored as a taxi driver. After Figgs jointed the projectionist union, he worked as a “daily projectionist” on many of the Hollywood films that were being made in Baltimore and environs, including some of Barry Levinson’s flicks. Unfortunately, this well-paying gig didn’t last long (1993-94.) The digital age brought it to an abrupt end. Once Waters talked with Figgs about what had happened to one of his earlier films, “Multiple Maniacs,” which has been sent to a distributor in Canada. Waters tracked it down. The Canadians had rejected the film, but declined to send it back. They felt it was their duty to destroy it since it was such “trash.” When Waters found out its miserable fate, “he loved it,” said Figgs. Figgs is proud of the fact that he participated, at age 16, in the “March on Washington,” along with 300,000 other Civil Rights activists, back on August 28, 1963. He vividly recalls standing on the Mall, looking towards the Lincoln Memorial, and hearing Martin Luther King, Jr. make his famous “I Have a Dream” speech. Figgs was also associated with the Walters Art Gallery in Baltimore City from about 2011 to 2014. He was in charge of visual presentations. He’s been married twice, divorced twice and has two grown boys, Ivan and Oliver.